Models pose at the Telfar Presentation during New York Fashion Week at BLADE Lounge on September 9, 2018 in New York City. Queens, NY-based designer Telfar Clemens staged an all-black preview of his Spring-Summer 2019 collection, titled “Not for You, for Everyone,” in London this August, but still managed to make it stateside to present his latest collection during New York Fashion Week. His SS19 NYFW presentation took place in a vacant lot adjacent to BLADE Lounge on the city’s West Side, with a return appearance by South African musical duo FAKA and other talents to help bring his vision to life. FAKA (lower left) and other musicians perform at the Telfar Presentation during New York Fashion Week at BLADE Lounge on September 9, 2018 in New York City. 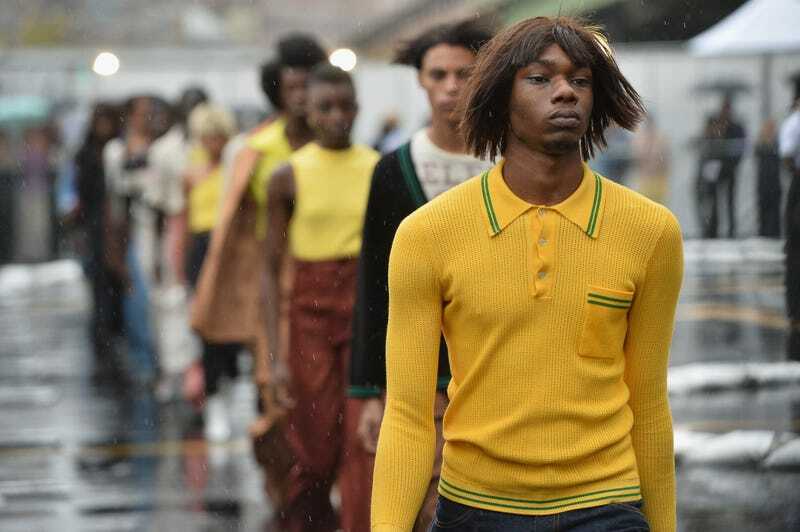 The rainswept venue proved the perfect setting for Telfar’s vision for spring, a gender-fluid collection which leaned heavily on ‘60s and 70's color schemes and late 70's punk nostalgia, even placing era-evocative wigs on the heads of several of the all-black cast of models. The presentation’s color story, silhouettes and setting evoked instant visual associations with film and television classics like West Side Story, Cooley High and Good Times. Mustard, russet, olive and denim blues all featured heavily in the collection, as did patchwork, varsity and stars-and-stripes motifs and the Budweiser logo, thanks to a collaboration with the 142-year-old beer brand. The effect? Good old American nostalgia designed not just for a presumptive “you,” but for everyone. A model walks at the Telfar Presentation during New York Fashion Week at BLADE Lounge on September 9, 2018 in New York City.